Loretta is the oldest of the three cats that currently rule my life. 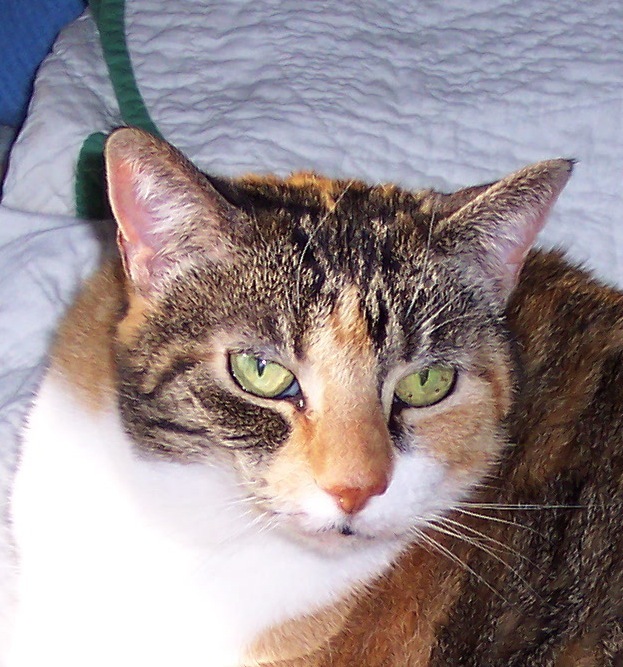 She’s a big, beautiful, and friendly 14-year-old calico cat. We adopted her from a family that had taken in a pregnant stray cat. The youngest daughter in the family latched onto one of the kittens and carried her around all the time. The mother didn’t plan to keep the kitten, so she didn’t allow her little girl to give the kitten a name. They called her “best friend kitty” because she was the little girl’s constant companion and best friend. In some ways it was difficult to adopt the kitten because we felt bad about taking away the little girl’s best friend. On the other hand, we invited the little girl to come and visit her best friend. She did—“best friend kitty” definitely remembered her—and was happy to see that her best friend had a family that loved her and took good care of her. We renamed “best friend kitty” Loretta. Credit for the name goes to Mike Lange, the long-time play-by-play announcer for the Pittsburgh Penguins of the National Hockey League. Lange is known for his somewhat off-beat expressions, such as “Michael, Michael motorcycle,” “Ladies and gentlemen, Elvis has just left the building,” “Well scratch my back with a hacksaw,” “Get in the fast lane, Grandma, the bingo game is ready to roll,” “She wants to sell my monkey,” and, of course, “Look out, Loretta!” Most of the time we call her “Rootie.” The boy came up with that nickname. Loretta is a really great cat. She brings me socks. She has a special sound she makes when she is carrying a sock in her mouth which we, the ever-imaginative and creative Todds, call the sock meow. Loretta’s sock meow is loud. Really, really loud. In the past year or two, Loretta has spurned the white athletic socks in favor of cat toys. She brings me the cat toys now instead of the DH’s socks. 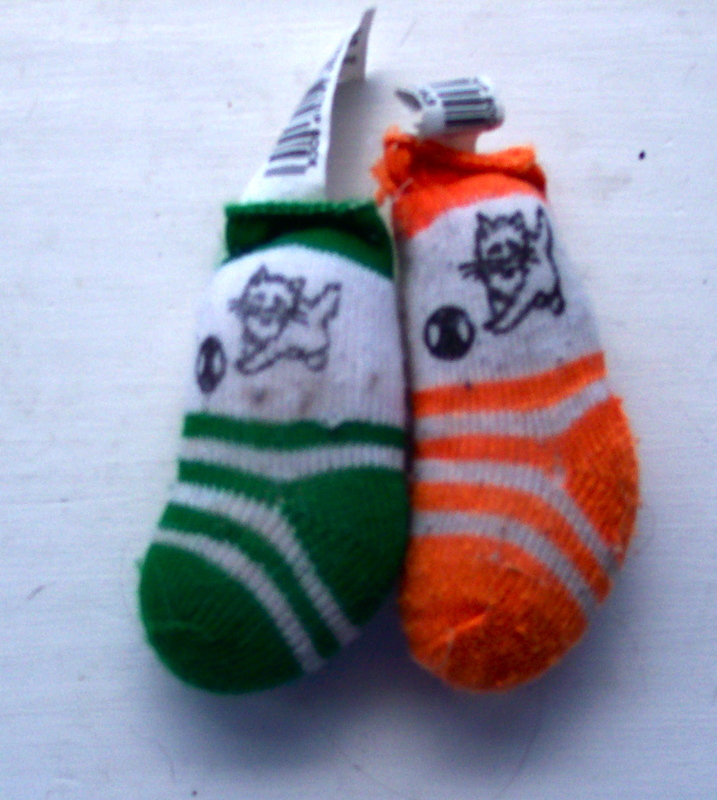 But these are not just any cat toys; they are toy socks. Yes, they are small socks that are stuffed with some sort of catnip concoction. We buy them in the cat toy section of the local Agway store. We have three of them now, two orange and one green. I led a catless childhood. My mother is allergic to cats, so we never had any around. We were a dog family. I love dogs. But when I was in college, I was finally introduced to the wonderful world of cats. And guess what? I discovered that, as much as I love dogs, I’m really a cat person. Who knew? My cats love to sleep on my WIP (works in progress), on my knitted afghans, on any shawl that is lying on a bed, couch, chair, floor…yes, they especially love rolling on wet wool pinned out on the carpet to block and dry.